Custom duck shape bottle opener animal key holder can be availed for fun marketing if you believe marketing is also about evoking smiles and buying confidence! 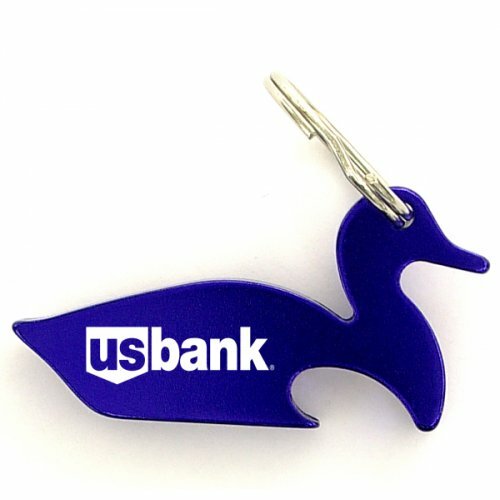 This versatile key tag can keep your campaign floating above the tides of competition with its uniqueness! You can either gift it as an individual token or as a compliment or as a combo gift with some special purchases. Along with assured smiles, long term visibility and affordability- you can expect to make huge savings on bulk orders. Request a quote to know about discounts on wholesale customized duck shape bottle opener key holder. Features – Duck shaped aluminum body in metallic finish. Available Colors - Metallic Blue, Metallic Black, Metallic Gold, Metallic Purple, Metallic Green, Metallic Red & Metallic Silver. Imprint Method – Laser Engraving, Printed & Full Color Process. Imprint Area : 1" x 1/2"